Innovative Rotherham company, Xeros Technology Group, has shipped 16 near-waterless washing machines to the drought-inflicted Cape Province region of South Africa. It recently renamed its Xeros Cleaning Technologies arm to Hydrofinity. Cape Town is just one region where drought has led to a permanent change in water consumption being legislated, creating increased demand for Xeros' sustainability credentials in geographic markets that can no longer ignore issues around water scarcity. The innovative solution offers a revolutionary leap forward in sustainability, replacing water with its reusable and recyclable polymer XOrb technology. Nylon spheres, called XOrbs, deliver up to an 80% reduction in water use and material reductions in both energy and detergent, whilst delivering a superior cleaning result compared to traditional cleaning by absorbing stains and stray dye as well as extending linen life. Xeros' technology will be delivered into the South African market by fanute as the sole distributor for Hydrofinity near-waterless laundry systems in South Africa. Hydrofinity operates a network of approved distribution partners in markets where significant water stress is creating growing demand for its water-saving technology. This is the first of several large shipments expected to be sent in the next two months to Hydrofinity approved distribution partners in countries with high water stress and high water cost. Mike Ferrand, managing director of Hydrofinity, said: "Our near-waterless technology will bring huge sustainability benefits as climate change and a rapidly growing population place enormous stress on South Africa's water resources. "We are now starting to make significant shipments of Xeros machines around the world. As businesses struggle with stringent restrictions on water use, our award-winning solution offers a sustainable alternative with significant competitive advantages. "Around the world, governments and utility companies are beginning to use water pricing and taxes to reflect the need to reduce water consumption and we are ideally placed to help commercial customers minimise their water usage and cost." 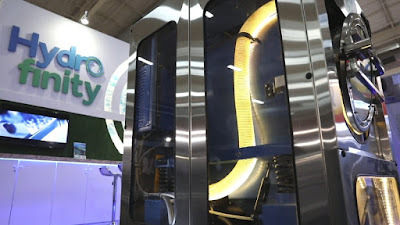 The machine is developed for industrial use, and because of its low water and electricity usage, users could start to see a return on investment in 18 months or so. With South African hotels alone using 1.5 billion litres per year of water in their laundry a near-waterless machine can have a significant beneficial impact on the hospitality sector.